March | 2013 | RicksBlog.com Home of "The Domain King®"
A 'Recognized Group' is something I have never written about until today. A 'Recognized Group' in domaining is sort of a franchise with no organization or franchise fee. Just a wave that establishes a stream of sorts and credibility at the same time and is memorable. Many of the domains I registered over the years fall into these categories. For example in 2008 'Joe the Plumber' got notoriety and joetheplumber.com was a great domain name that got repeated and and copied. JoeTheBarber.com, JimThePlumber.com, TonyTheWaiter.com. All of these are examples of a train or trail and a branding not done by you but taken advantage by you with the draft of driving behind an 18 wheeler truck. In the 800 era it was 1-800-THE-CARD by American Express. If you were lucky enough to own one of the other words followed by 1-800-THE-???? well you were in business. You were part of a 'Recognzed Group'. Being part of a Recognized Group gives you credibility without earning it. Just instant street cred. Human nature. Never fight it. Here is another example. I used to own a Pizza place with my brother on the boardwalk on Cape Cod. When we were having our sign made, we had to decide what to put on it. Did we put the name of our pizza place there? NO! We did not do that. But we did put one word there. Big, bold, seen for 2 blocks away because nothing else really mattered. Branding would mean our name would be bigger and our product would be smaller. On a boarwalk you don't have time to brand. You don't need to brand. You need to sell. That was the day I learned about 'Recognized Groups' but TODAY was the first time I have ever been able to put a name on it and also put it in words with examples. Happy Easter, Good Passover, Great Sunday! The Missing Link…..Need, Want, Desire…..Meet VALUE! Need, Want, Desire is what I have talked about in length in regards to the elements needed to make a sale. Now let me tell you what is need to CLOSE the sale. VALUE. Once Need, Want and Desire are there, it has to be wrapped up in value and benefits. That my friends is the formula we will be using. 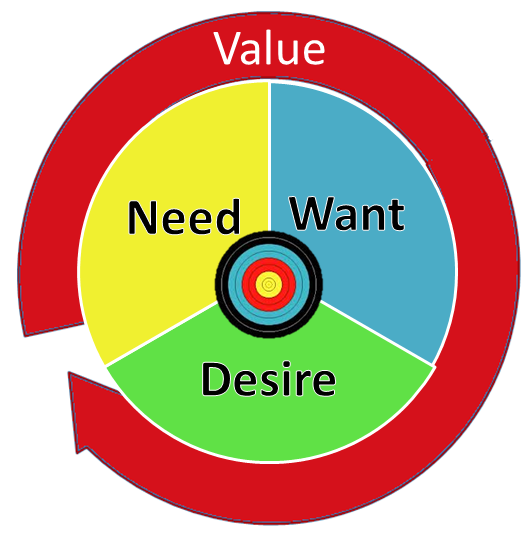 And even when one of the elements of Need, Want, Desire are not present at first, VALUE brings that missing element back into the fold because each has to reconsider those elements once you talk about value. The Bullseye is the opportunity all thse elements together bring. Like a great recipe. On their own the ingredients are no as important as they are combined. When merged together........an entire new product appears. JointVentures.com and the First TWO Actual emails to me from Danny! Danny Welsh and I have been working face to face this week for the FIRST TIME since we launched JointVentures.com. Pretty amazing to get this far and have our FIRST face to face discussions nearly 6 months into this project. By tonight we will have spent about 45 hours together getting systems in place and starting next week you will see some visible progress and for the first time you will begin to see the vision we have and what we are going to do to change the lives of every domain investor reading this that have lease quality domain names. I just got his 2011 Christmas card in January 2013 because I only check that particular PO Box 1 or 2 times a year. The seed for all this was planted Last April 29th and before that. Matter of fact, I have seen evidence this week that Danny started working on this over a year before he ever contacted me. Last April 29th he wrote me an email. He also wrote 19 more. He figured it would take 20 emails to me to get to 'Yes'. Well he basically got to yes on the first email as it appears below. And as they will say someday....The rest is HISTORY! I only have one mission and one goal and that is by December 31, 2013 to demonstrate to an industry an old and very profitable direction. We are going to change lives and we are going to do it right in front of you just like we have done so far. But by T.R.A.F.F.I.C., which is just 8 weeks away, your doubt will be washed away with what we will make public at that time. Then every single domain investor will start kicking themselves for selling a domain for $1000 that had the capability to earn $1000/month. 'Hey Rick, You may remember my name...or not. But I assure you, before it's all said and done we WILL be joint venture partners. I've made a number attempts to reach you in the last 3 years since stumbling across your blog and realizing the power of the 'starving crowds' you managed to find and gain leadership of by securing so many amazing keyword-rich domains with “type-in traffic”-- while all the Madison Avenue 'branding experts' do boneheaded things like spend millions on SuperBowl commercials for crap image impression purposes. It's the same thing I've been saying, trying to get your attention. But in the last couple years I've significantly increased the value I could bring to any joint venture with you-- most specifically in the realm of copywriting (ie salesmanship in print), having written salescopy for over half a dozen client projects that exceeded one million dollars in sales so far. Let me use my skill as a copywriter and in building joint venture relationships to help you match audience to content. I know I can develop one of your type-in traffic domain audiences into a more profitable income stream. Let me know your idea and how you see it unfolding. 'Rick, my desire to work with you is enough that frankly wherever you feel a motivated individual talented in copywriting and joint venture deal-making could add the most value is where I’d like to begin doing business with you. I have read in your blog that you have this goal: “I just want 100 different running businesses that require no time.” I believe there’s plenty of opportunity for me to use my skills to make money in partnership with you by helping you reach that goal. While I could give you a thumbnail sketch of a half-dozen different ideas to propose for monetization of one of your single domain names— which is likely the kind of proposals you receive most often— I’m confident you already know one or more certain domain properties or verticals in your portfolio that is under-performing compared to potential-- where a degree of effort, creativity, and salesmanship by someone like me could significantly increase income without work or hassle to you. 1. Passive joint venture attraction: Allow me to create a salesletter-style “offer” of your partnership program for companies that would like to leverage your significant traffic sources in a certain vertical and in exchange pay you ongoing residual revenue share and/or equity stake per your preference. I believe an easy and quick testing roll-out of this idea could be accomplished with minimal time investment on your part simply by re-positioning www.jointventures.com -- and any other JV-related domains you may own-- with a copy of this offer letter. The letter would include the following: a primer on the power of type-in traffic, vertical industries available for targeting, figures of average visitors in each, criteria for partnership, and a solid qualifying application—all of which I believe I can achieve from my observations and notes of your stated goals combined with a short conversation with you to ask some questions to make sure my understanding is accurate and uncover some metrics and facts you believe might help me ‘sell’ it in print. In addition to writing the letter, if you feel appropriate I would like to serve as an initial qualifying “filter” to protect your time and negotiate with inquiries initially. Upon success of such a test, I would propose broadening the sources of traffic by pointing relevant domains to a vertical-specific version of this partnership offer letter to receive joint venture inquiries that are laser targeted proposals. As proof I can do this, I offer the following experience: I have written a salesletter for a client whose joint venture networking summit has attracted 100-200 attendees each time it has been held at a price point of $1495 (happy to send you a PDF if interested), so I really feel like I understand the JV mindset and value of companies partnering together. Each deal earning more income through the new joint venture than the existing domain asset does via parking would be one more business towards your goal of 100. 2. Active joint venture prospecting: Let me actively target companies offering products and services perfectly matched to the audience visiting select generic domains of yours, and in partnership with you, take on the responsibility to solicit ideally suited operating businesses that have solid prospect-to-sale conversion track records, negotiate with them, and close revenue-sharing deals. For example, if you told me that you’ve always felt a set of specific domains in your portfolio with significant regular traffic could earn much more income-- but actively pursuing another monetization opportunity is not compatible with your existing lifestyle or time limitations-- give me a chance to create a monetization joint venture on your behalf for each. 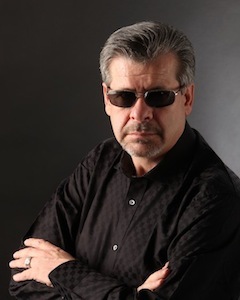 As proof I can do this, I offer the following experience: I have successfully negotiated a number of lucrative joint venture deals in real estate, information affiliate marketing, and others (albeit admittedly none so significant yet as some of yours). I believe an easy and quick testing roll-out of this idea could be accomplished with minimal time investment on your part simply by your providing me with verbal authorization to represent 5-8 of your existing domain portfolio, with you of course as the final say on any deals struck. Upon success of such a test, I would propose allowing me to recruit a team of other such active joint venture prospectors. Each deal earning more income through the new joint venture than the existing domain asset does via parking would be one more business towards your goal of 100. 3. Joint venture & advertising commission sales team: Upon success of #1 and #2, let me recruit, train, motivate and manage a commission-only sales force who would operate a telephone sales effort responsible for actively presenting your domain name portfolio partnership and advertising options to strike revenue-sharing JV deals and/or sell advertising on your behalf. As proof I can do this, I offer the following experience: my real estate business partners and I have received to date over 1100 applications to work for free in our apprenticeship program at MMMChallenge.com. This was managed with resources, influence and opportunities that are small in comparison to yours; thus, I am confident recruiting a quality group of salespeople on your behalf can be managed without a great deal of input from you. Each joint venture deal created would be one more business towards your goal of 100. As you no doubt saw yesterday, the 'Big Hype' is already starting x 1900 coming soon. Here is where it all goes off the rails. The HYPE vs the real Type-ins that are not and will not be there. The foundation for WHY .com is the leader. Without that foundation, then the dynamics change. But even then there are other foundations left to support .com. Like every major company in the world operating and headquartering ALL operations from the .com. So we are going to have to endure all this HYPE that may or may not be real and will be framed in certain ways. So when you hear the HYPE then ASK the right questions or you will be a victim of a hype-in not a type-in! So the logical missing part of this equation is how many different companies and different owners actually registered those? How many were domainers less than an arms length and how many were end users that are going to make their mark on .heretodaygonetomorrow. I think 2 or 4 people registering 4000 names is different than 2000-4000 people getting one or two each for example. I wish Div nothing but good luck as I will with each new .whatever. But when it comes to what I see in each, I will never color it up to please. Reality has to trump Hype or we have lost our minds and souls! Over 6 month I've been subscribed to your blog with a desire to learn what makes a successful domain investor. Here is what I picked up thus far. 1. You are very smart and people that buy your domains are also very smart. 2. You have a vision and people that buy your domains also have a vision. 3. You were in the right place at the right time, and that makes you very smart and gives you a vision. 4. Everybody else that does now share your vision is a looser and has no vision. And since there is nothing more (or ever) to learn I have no choice to remove your blog from my reader. 'Anthony, sorry to hear you are GIVING UP at the start of things. That's what will make you a loser in life. Nothing I can say can or can't do that. Sorry I took you out of your comfort zone. Your ACTIONS or any ones ACTIONS are what makes winners and losers. Or in-actions. So you went off the deep end on #4. My vision does not invalidate somebody else's vision. But if their vision fails....then what? Am I supposed to make believe there was a different reality? Did Borders have a chance to stay in business? Who dropped the ball there? Don't you think dissecting something like that has value? Decision makers that were trusted to make good decisions ran their company out of business. So is it off limits to point that out? Ask the CEO, President, 25 VP's how they did that? Giving up is what makes somebody a loser Anthony. And if you are running away, then it is because I said something that hit close to home and pissed you off. Good! What would YOUR response be to Anthony?